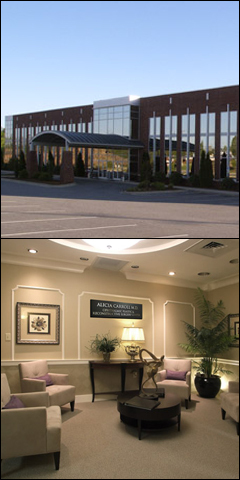 Having practiced ophthalmic plastic and reconstructive surgery in Hickory for nearly five years, Dr. Alicia Carroll opened Alicia Carroll M.D. Ophthalmic Plastic & Reconstructive Surgery Center, PLLC in November, 2005. Currently, Alicia Carroll M.D. operates two separate divisions. Alicia Carroll M.D. Ophthalmic Plastic Surgery offers corrective and cosmetic surgery of the eyes and face. Alicia Carroll M.D. Lasers & Aesthetics offers a wide range of non-invasive laser skin treatments and aesthetic procedures. Having each of these services available in one office allows patients of Alicia Carroll M.D. the opportunity to combine corrective, cosmetic and aesthetic proceduresâ€”giving them the best result possible. Dr. Carroll received her Doctor of Medicine degree at University of Medicine and Dentistry of New Jerseyâ€”Robert Wood Johnson Medical School. She completed her residency in ophthalmology at State University of New York Health and Science at Brooklyn. In addition to being the only female ophthalmic plastic and reconstructive surgeon in North Carolina exclusively practicing this sub-specialty of ophthalmology, Dr. Carroll was one of 12 physicians trained each year in ophthalmic plastic surgery though the American Society of Ophthalmic Plastic & Reconstructive Surgery. Dr. Carroll serves on the Board of Visitors, an advisory board of Lenoir Rhyne College and previously served on the Board of Directors for the Hickory Community Theatre. She is an active supporter of charitable organizations, including the American Heart Association and the Susan G. Koman Breast Cancer Foundation.